Upon Arrival at Delhi IGI airport, welcome by Bharat Yatraa representative & transfer to hotel for 02 nights stay. Day at leisure & overnight at hotel. It is world's tallest minaret. It's hight is 72.5 meters (237.8 ft).Construction commenced in 1193 under the orders of India's first Muslim ruler Qutb-ud-din Aibakan. Humayun Tomb: Memorial mughal emperor Humayun, built in the year 1562. The Complex is World Heritage Site. Lotus Temple: The Bahá'í House of Worship in Delhi, popularly known as the Lotus Temple due to its flowerlike shape. Raj Gath: Cremation site of Mahatma Ghandi, Chandni Chowk: One of the main market of Old Delhi & India Gate. And drive past parliament house and President house. Overnight at hotel. Breakfast & drive to Bikaner, arrival transfer to hotel for 01 night stay. Afternoon sightseeing of Bikaner visit Junagarh Fort: It is an unassailable fortress, which had never been conquered. Built in 1593 A.D. by Raja Rai Singh, one of the most distinguished generals in the army of Emperor Akbar, the fort is a formidable structure encircled by a moat. Lallgarh Palace: This architecture is a fusion ofRajput, Mughal and European architecture & Camel birding farm: which is only one of its kinds in Asia. Overnight at hotel. The Jaisalmer fort, known as Sonar Quila or the Golden fort, rises from the sand and merges with the golden hues of the desert ambience. 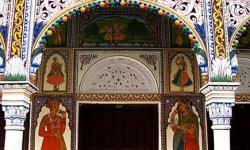 Salim Singh ki Haveli: This haveli is actually worth seeing from outside only. It was built in the first half of the 18th century and a part of it is still occupied. Patwon ki Haveli: A group of apartments, this is one of the largest and most elaborate of Havelis in Jaisalmer and stands in a narrow lane. It is five storeys high and is extensively carved & Gadisar Lake: This is a rain water conservation lake built by Maharawal Gadsi in 14th century. Itwas once the main source of drinking water for the entire town of Jaisalmer. Evening experience the camel ride & Sunset at Sam Sand Dunes. Overnight at hotel. After breakfast drive to Jodhpur, upon arrival visit Mehrangarh Fort: This fort is one of the largest fort in India. 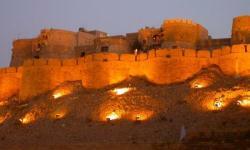 the fort is situated at an altitude of about 125 metres and is spread over an area of 5 sq km, with seven gates. It has been a witness to the splendor of bygone era. Jaswant Thada: The cenotaph of Jaswant Thada, near the Mehrangarh Fort is a memorial dedicated to Maharaja Jaswant Singh. Rest of day leisure at hotel or explore the Old city bazaars. Overnight at hotel. Ranakpur is widely known for its marble Jain temple, and for a much older Sun Temple which lies opposite the former. The dating of this temple is controversial but it is largely considered to be anywhere between the late 14th to mid-15th centuries. 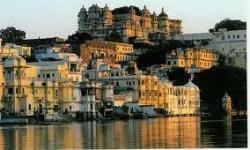 Later continue drive to Udaipur, upon arrival transfer to hotel for 02 nights stay. City Palace is the largest royal complex in Rajasthan. Saheliyon ki Bari: A beautiful garden known as 'Saheliyoin-Ki-Bari'. This small ornament garden with its fountain, Kiosks, marble elephants and delightful pools. Bhartiya Lok Kala Mandal: The interesting collection exhibited by this Indian folk arts museum includes folk dresses ornaments puppets masks dolls folk musical instruments folk deities and paintings. Jagdish Temple : Built in 1651A.D. by Maharana Jagat Singh, this Indoarmy temple is the largest and the most beautiful temple if Udaipur with noteworthy sculpted images. Evening enjoy the boat ride on Lake Pichola. Overnight at hotel. After breakfastdrive to Pushkar, welcome to the land of saints & seers. Check-in at hotel for 01 night stay. 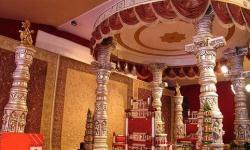 Evening tour of Pushkar visit Ghats, Brahma Temple, Savitri Temple. Overnight at hotel. Leisurely breakfast at hotel and later drive to Jaipur, check into hotel for 02 nights stay. Afternoon city tour of Jaipur visit City Palace: The main palace is an imposing blend of traditional Rajasthani and Mughal art and architecture, Jantar Mantar: The Jantar Mantar is a re-phrasal of the Sanskrit word yantra mantra which mean instruments and formulae & Hawa Mahal: This five-story, pyramid-shaped structure endorse 953 small peepholes, each with tiny lattice worked (jali) pink windows and arched roofs with hanging cornices. Overnight at Jaipur. Amber Fort is situated in Amber, the ancient capital of the Kachhwaha Rajputs on a hillside overlooking Maotha lake. A beautiful complex of palaces, halls,stairways, pillared pavilions, and temples built by Maharaja Man Singh I & enjoy Elephant ride bottom to top of the hill. Rest of the day free for shopping & personal activities. Overnight at hotel. The historical city was constructed by Mughal emperor Akbar beginning in 1570 and served as the empire's capital from 1571 until 1585. Late continue drive to Agra for 01 night stay. Afternoon visit Agra Fort: Built by the great Emperor Akbar in 1565 A.D, is a master piece of design with beautiful mosques and palaces. Overnight at hotel. Taj Mahal built by the Mughal Emperor Shah Jahan as the final resting place for his favourite Queen. Later back to hotel for breakfast. Afternoon drive to Delhi, on arrival departure transfer to international airport for flight back to onward journey.